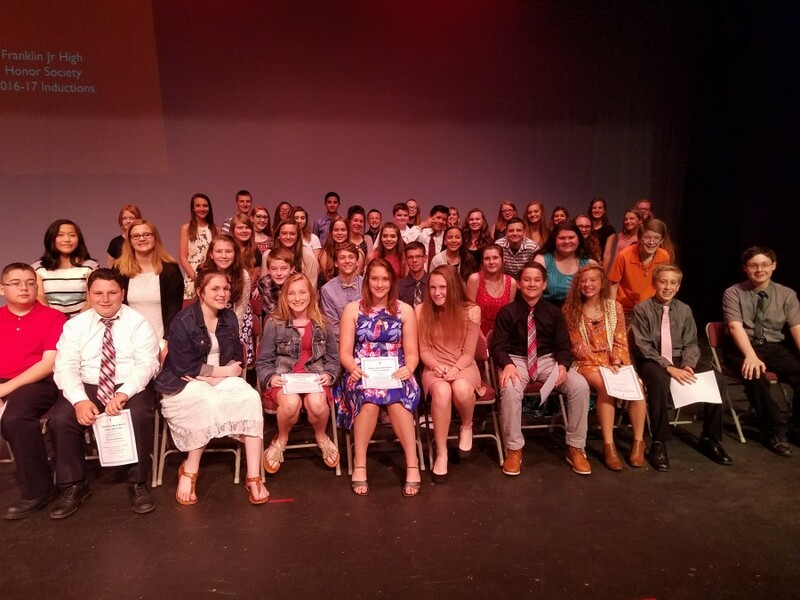 Franklin Junior High School inducted 29 students into its chapter of the National Junior Honor Society on Thursday, May 11. The chapter was established in 2014; this was the third class inducted. Those inducted were Ashley Back, Eryn Back, Isaiah Bales, Hudson Black, Sydney Cook, Weylin Crabtree, Kaity Dalton, Hayla Gadd, Makenzie Graf Frost, Jamie Harris, Kierra Harris, Tess Johnson, Isabella Knipper, Kara Kraus, Andrew Kuntzman, Nina Lin, Robert Lipps, Emma Madden, Ellie Mullins, Haylee Owens, Ashtin Parker, Erin Phillips, Samantha Phillips, Dylan Trenum, Andrew Wagenknecht, Josie Whaley, Gabrielle Winkle, Colton Wolf, and Mallory Wulff. The inductees joined 23 students who were inducted last year. They include Kyla Williams (Chapter President), Addie Imundo (Vice President), Jeffrey Davis (Treasurer), Harleigh Hanks (Historian), Addie Taylor (Community Service Chair), Garvin Adams, Fiona Baker, Tanner Biltz, Joseph Clayborn, Skylar Cox, Joe Current, Jesse Ferguson, Jackie Greene, Hannah Hall, Ashley Hall, Victoria Hamilton, Harleigh Hanks. Lexi Lewis, Gavin Loyd, Liza O’Hara, Anish Patel, Katy Trevino, and Evan York. The National Junior Honor Society was established in 1929. According to its website, NJHS is "one of the nation's premier organizations established to recognize outstanding middle level students." Students must demonstrate excellence in not just academics, but in leadership, service, and character. Hannah Sove is the advisor of the FJHS chapter of the NJHS.